NAPLES provokes great debate. At first glance, it is dirty, unruly, scary and ugly. It is a sprawl, Italy’s most densely populated urban area, overlooked by Vesuvius, Europe’s most dangerous mainland active volcano. A 30 minute walk around Naples may bring you to the conclusion that this city of 3.5 million people is dancing, both literally and metaphorically, on a volcano. Poverty runs through Naples like a fast-flowing river, from the bongo-thumping begging-buskers to the litter-strewn side streets where washing hangs from rusting balconies and window boxes. It is hard to believe that a city such as Naples should be part of the same country as Milan and Rome. While Milan has its black-clad fashionistas that stalk the grand shopping arcades, Napoli is a city of the street, characterised by tight alley-like thoroughfares like the scooter run of Via Tribunale where all life can be found. 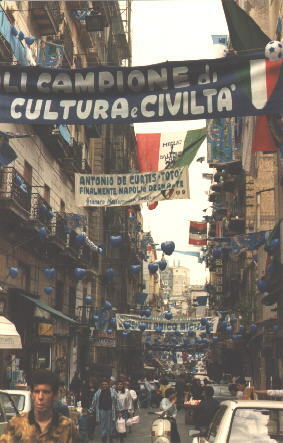 It’s a one-football club city, is Naples. You are warned not to display allegiance to any other club, especially AC Milan, Inter, Juventus and Roma. You can buy Napoli souvenirs everywhere, some official but mostly cheaper copies. Whether you spend one euro or 10, the message is the same: “Forza Napoli”. There’s no other football narrative. Napoli have been one of the most consistent teams in Serie A in recent years, but they still have some way to go to match their golden period between 1986 and 1990 when Napoli won two Serie A titles and played in front of 70,000 people at every San Paolo home game. Today, the club’s average gate is 33,000 – somewhat down on the glory years. In that period, 1984-1991, this deeply religious city – every cab is adorned with a rosary – found a new idol to rival the man upstairs, a squat Argentinian by the name of Diego Armando Maradona, the most revered number 10 since Pele and the perpetrator of the most memorable hand action since Michelangelo’s image of god reached out to give life to Adam, as recorded in the Sistine Chapel in Rome. Maradona arrived in Naples in 1984, a refugee from a mostly uncomfortable spell in Barcelona. He joined the Catalan club in 1982 following a disappointing World Cup debut in Spain, which culminated in Argentina losing their crown and the young Maradona being sent off. His time with Barcelona, albeit under compatriot Cesar Luis Menotti, was hampered by injury, illness and ongoing disagreements with Barcelona officials. In hindsight, Maradona and Barcelona was a bad match, a mighty club unprepared to allow an individual appear larger than the institution. Why the perfect union? Maradona grew up in a poor district of Buenos Aires, a city with distinct Italian influences. Naples could well slot into anyone’s idea of a Latin American metropolis, its architecture reflecting a Spanish past. Neapolitan tour guides proudly declare that Naples is a city that flies in the face of the institutions created by man, an accusation that can easily be aimed at Maradona. Even today, it is the infamous Spanish quarters in Naples where Maradona’s exploits are so vividly recorded. When I enquired about personal safety in this neighbourhood, I was advised by locals to avoid it at all costs. There are murals, shrines and graffiti celebrating Maradona in these streets, some 25 years after his heyday. There are also bullet holes in some of the frescoes, fired there by local criminals. It’s no surprise that he should still be adored, for in 1987, Maradona inspired a Napoli side that included names like Giordano, Carnevale, De Napoli, Ferrara and Bagni, to the club’s first Scudetto. It sparked off celebrations that are still talked about today. Naples cavorted for a week and gloated that they had finished ahead of Milan, Inter and Juventus. They also won the Coppa Italia in 1987. They should have repeated the trick in 1988. Strengthened by the arrival of Brazilian Careca, Napoli were top until the last few games when they strangely – and controversially – lost form. Maradona topped the Serie A scoring list and took no blame for his team’s collapse, allowing Milan to win the title. In 1989, Napoli won their first European prize when they lifted the UEFA Cup. 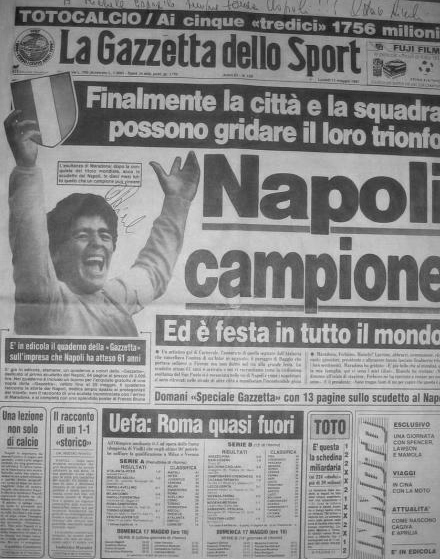 And in 1990, Maradona – who was now talking of moving to Marseille – led Napoli to a second Scudetto. But cracks were developing and during the 1990 World Cup, Maradona attempted to “divide and conquer” by urging Southern Italy to support his Argentina in the semi-final against Italy. It was a mistake that threatened to sour even his relationship with the Napoli faithful. By 1991, the dream was over. Maradona, now making headlines for the wrong reasons, left the club under a cloud and moved to Sevilla. Napoli’s moment in the sun was over. But he’s still good box office in Naples. You will always come across Diego Maradona memorabilia. T-shirts by the dozen, cardboard cut-outs, fridge magnets, posters, figurines and scarves. He’s almost as ubiquitous as Garibaldi, Victor Emmanuel, Pompeii and Vesuvius. And mention Calcio and Napoli and almost certainly, the third word will be “Maradona”. You don’t have to like him, especially if you’re English and remember Mexico 1986, but you cannot deny he gave Napoli the best of times. And for that, the San Paulo tifosi will be eternally grateful.